Super Hero Boy: Cute boys? What's not to love? Cute boys? What's not to love? Ok the Jonas Brothers may not exactly be my type (I'm far to old, and pregnant.) but they certainly get a lot of attention from the younger girls I know. 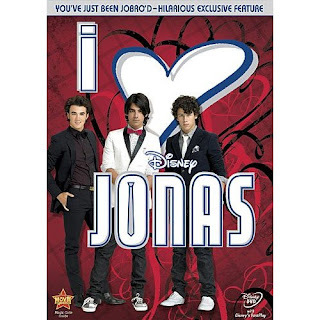 The new dvd feature I Heart Jonas says it all with the huge heart right in the middle of the cover. The Jonas Brothers are pure adorable eye candy for the younger set and you know I sorta kinda dig them. The new I Heart Jonas dvd is a collection of seven especially selected episodes that mostly focus on Joe's sweetheart crush on Stella which is almost too cute for words. Actually seeing as these guys are in their late teens/early twenties its almost a bit unbelievable. However the younger girls will ooh and aww over what I think every little girl hopes for in a boyfriend or admirer. Oh girls.. just wait you have no clue what it's really like, try a husband and a toddler son with a baby boy on the way. I think I'm all boyed out in general. Actually the show is really pretty cute if at little on the whole 1950s sorta mushyness. I think any mom would be proud to call one of the Jonas brother's her son in law so I honestly approve. It's good quality television that I wouldn't even remotely consider too much for the younger girls. The acting is decent, the show is actually quite funny, and its not overdone. The dynamic between the brothers is great and Joe's crush on Stella is really quite honestly believable. I'd certainly have no problems with my little girl watching if I had anything other than boys running around this house. My favorite episode on the dvd was Frantic Romantic and I have to say half of the reason is the quote "Lets not be those guys who wear their sunglasses at night." Heh. I'm not sure the average 12 year old would get that comment but it made me laugh. Poor Joe he has himself all caught up in a tabloid scandal with the super cute Fiona, the question is how he is supposed to get out of it after all people are even tweeting about it! You can pick up your own copy of I Heart Jonas on dvd right now at Amazon!